I am trying to figure out how to set the write TextFile Adapter file name to a field from the Read Text file adaptor. Can you explain this or direct me to a URL that shows and example. I have a field called OrderId, and would like the WRITE file to be named $OrderId$.txt . But I cant figure out how to reference the orderId field. You just have to use the Set Parameter Heater and set the desired Parameter “$orderid$” with the value of the certain field. In the TextFile Adapter you can use “$orderid$.txt” as file name. 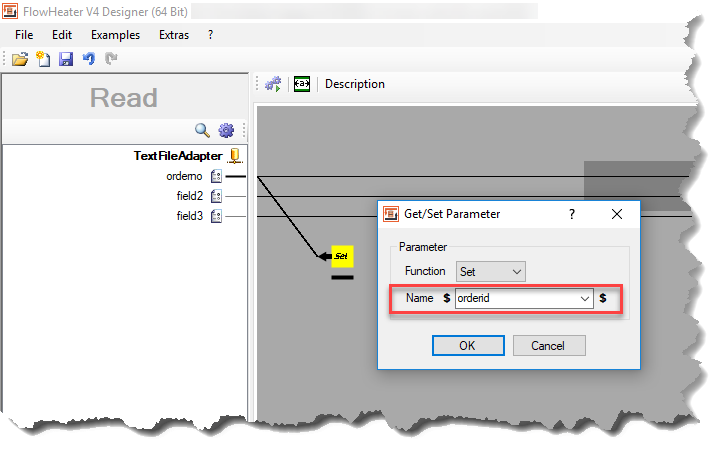 The TextFile Adapter replace the parameter $orderid$ with the current value. Attached you´ll find a simple example.